this one was done as busy-work; it's not a proper entry. 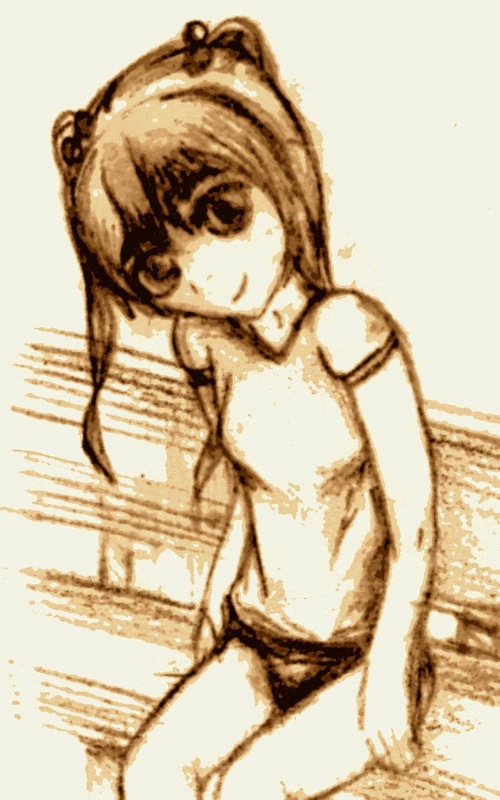 As always, Katawa Shoujo is proving an excellent inspiration for fan art. In that game, Emi's story was the first one I finished, and I really liked it; I'm surprised this is actually my first drawing of her. It came out alright, I guess. Everyone in that game has multiple outfits, but you see her in gym clothes most often (she runs track), so I went with that. I was getting tired of drawing the Yamaku school uniform anyway, and it gave me an opportunity to practice with the curvatures of stuff like arms. When you're drawing bare arms, you really only have the outline to work with for shape, which is harder than it sounds. For me, anyway. Ya know; beginner. I still can't do eyes right, so I had to erase and redraw them so many times that the paper is almost torn, but I got em down in just the nick of time. One more would have probably put a hole in it.When scanning it in, I gave it a little bit of a tint, and ran it through a filter or two. It otherwise came together without issue. Shirt folds in particular used to be a frustrating challenge, but I was able to make 'em happen comfortably this time. I'd intended to just make the basic pose in graphite, so I could do a proper color pencil drawing. But quickly found myself adding more and more detail, and eventually decided to just finish it this way, then scan it and add a tint. Good times.